I know allot of you have made your own version of a thin strip ripping jig. I fiddled with making one and was in too much of a hurry to get my project going. I looked at this one online and liked the design and it was only $19.99 with free shipping. 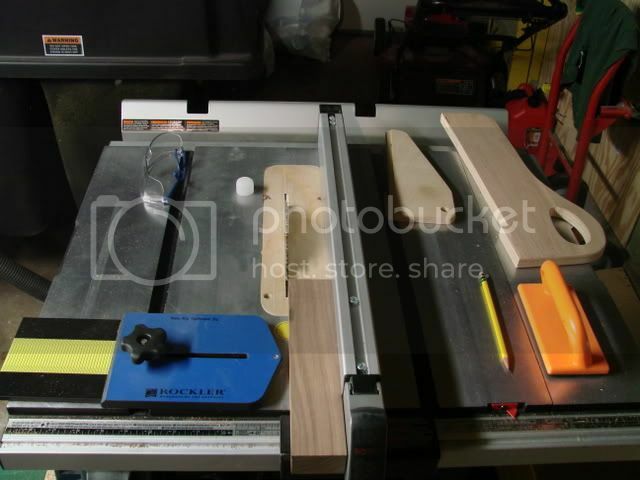 As usual Rockler shipped it out right away, and it was on my doorstep 4 days after I ordered it. They also accept Paypal now which is really convenient. It comes with simple instructions on the back of the box. The whole device is made out of phenolic and feels really sturdy and well made with an easy to read scale ( thats not graduated) with 1/8 and 1/16 marks. The knob is a decent size and allows good grip to crank it down nice and tight. There is a ball bearing at the contact point to help the wood glide through. The directions tell you to touch the bearing to a sawtooth and then use the scale to size your rip. Then slide the unit down carefully so its below the throat plate and lock the knob down. It leaves a slight burr on the upper inside corner of the keeper piece due to it falling away before it gets fully cut. This was no big deal, my pieces are over sized so I just trimmed that end. You could chisel the piece off as well. You have to position it below the throat plate. Any higher it seemed to push the piece against the blade and was causing some burn marks. Ones I moved it it was fine. Overall I like this jig. It makes it easy to rip thin and thick pieces safely and accurately, and doesn’t cost allot of money. I got the same thing when they first came out. Works like a charm. thanks for the review! looks like a cool little jig! Wish I knew what I was doing. I only make school science projects. I leave the real expertise, professionalism and artistry up to you guys that know what they are doing. Don’t see too good anymore so it is a good reason to let those things go. Great stuff and a least now I know what that is. Bye. Looks great, thanks for the review. Thanks for the review. I have been looking at one of these as well. This is the story of my life!! Woodcraft Magazine paid me $100 a couple of years ago for this same device idea. Now Rockler makes a fortune. 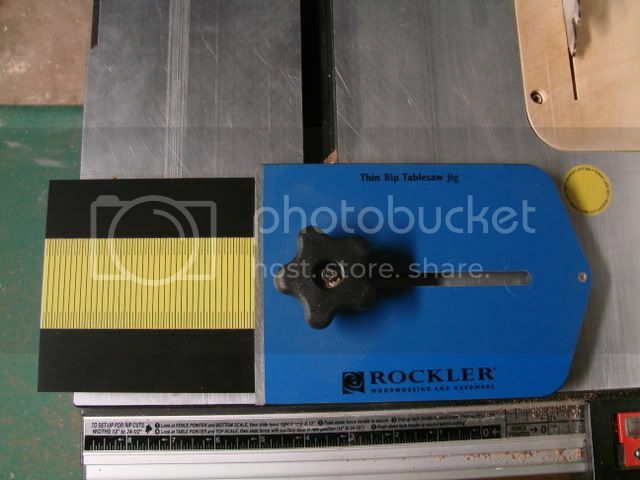 Just got an e-mail from Rockler…it’s on sale there…I have no affiliation with Rockler, outside of buying more than I should there…when they call you by name when you walk in, is that bad? I got one these and it works very well. I made one with the other end of a feather board, and a bearing dadoed into the end. idea was great but I will return mine. Looks like a cool jig at a good price. Picked one up this weekend, partially because of this review. Thanks! That looks like a handy little jig. I have one and was having trouble getting it dialed in. Your review has helped. Thanks.